Aisling Grove is a Jacksonville-based band playing Irish and Celtic music, both traditional and contemporary, including pub songs, beautiful ballads, and instrumental jigs, reels and polkas..
Kat Braswell (Harp, Vocals) is a classically trained harpist with a strong passion for learning, teaching and performing folk music and traditional Celtic tunes. When she isn't harping, Kat enjoys middle eastern drumming, various dance forms and a great beer. Robin Aronson (Accordion, Bouzouki, Tin Whistle, Bodhran) has been performing since the age of 14 when she was a street accordionist at St. Augustine's annual Day in Spain Festivals. She comes from a 30 year background of performing Renaissance music where she played harp, recorders, crumhorns and violas da gamba. Susan Staton (Violin, Viola, Mountain Dulcimer, Vocals) is a multi-instrumentalist with the main focus as a violinist/fiddler and she enjoys playing and teaching different styles of music. She played and studied classical violin for approximately 20 years and played in University and Community Orchestras during that time. She got into folk music in 2007 concentrating on old time fiddling and in 2013 competed and won first place in the Fiddle and Dulcimer Senior level competitions at the Florida Old Time Music Championship. Her current passion is Irish music thanks to an amazing trip she took to Ireland in 2015. Dan Forney (Mandolin, Vocals, Tenor Banjo) has a background in traditional American Music including bluegrass and old-time fiddle tune. He has played in several bands in Southwest Virginia and Amelia Island. Jack Sharpe (Mandolin, Octave mandonin, Guitar, Vocals) has a musical background that consists of these instruments along with fiddle and banjo, playing Old Time, American and folk music for 20+ years. 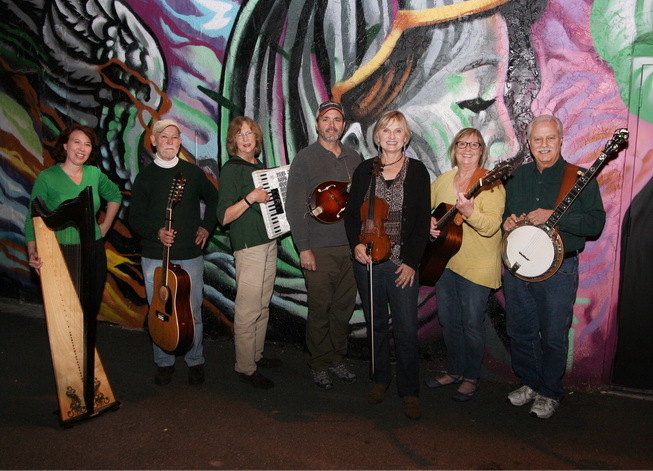 Betsy Andrews (Vocals, Rhythm Guitar, Fiddle) has a musical background that has included singing vocals with the Jacksonville Lyric Theatre and other choruses in the community. She also plays and sings with a Bluegrass / Americana Band. Jack Piccalo (Banjo) is a lifelong banjo player who loves all music, especially anything with banjo. Over the years he has performed with several bands traveling the festival circuit, clubs, parties and many other venues. In addition to Celtic, his playing styles include bluegrass, oldtime, melodic, swing and some classic style.